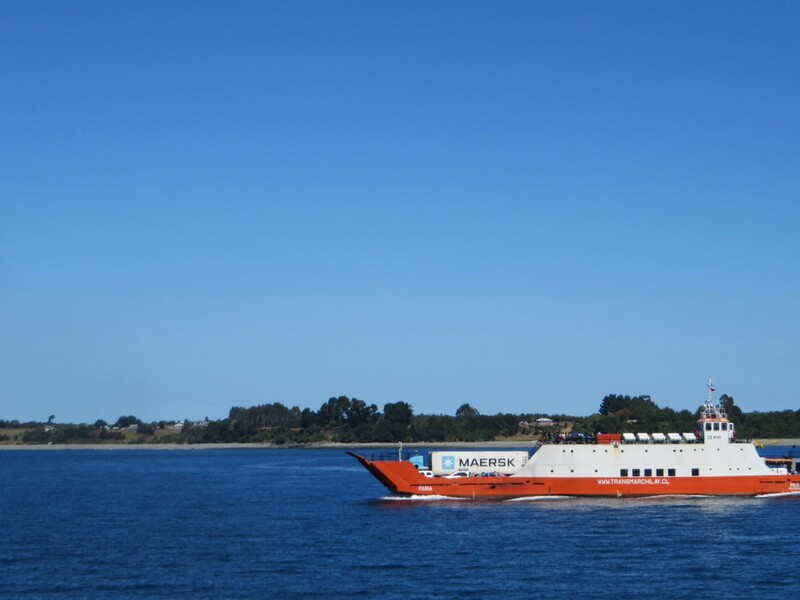 It’s a short ferry ride from mainland Chile to Chiloe Island. I lean over the railing to watch sea otters lounging in long strands of kelp, dolphin leap-frogging, pelicans skimming along a crest of surf. Snow-capped Osorno Volcano is visible alongside the Andes range in the distance. Wind tugs at the roots of my hair. Yes, the air smells of diesel fumes, but the sky is a pristine azure blue, without the brown haze we’ve become inured to seeing in cities around the world. Surrounded by this gift of exquisite beauty, I can’t help but feel joy. 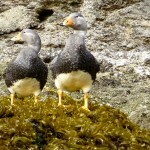 I’m on a tour of Patagonia with Overseas Adventure Travel (OAT). After disembarking, we walk along a boardwalk, home to hundreds of black-necked swans, oyster-catchers, cormorants, steamer ducks. There are sixteen UNESCO World Heritage-recognized churches on the island, wooden-shingled structures build by local carpenters, blending Spanish Catholic and indigenous influences. 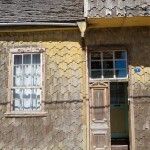 The houses, too, have their own distinctly shaped cedar shingles. Some are painted blue or green or orange, some left to the elements. The residents fish and raise sheep and sell woven handicrafts to tourists. Before the afternoon is out, we’ve already identified any number of modest one or two-story homes where my traveling companions and I would be happy to live, perched above the shoreline. It’s the kind of idyllic life easily romanticized. But progress is coming to Chiloe Island. 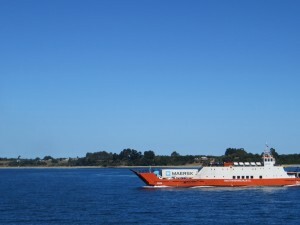 In 2013, the Chilean government approved the building of a bridge across the Chacao Canal connecting Chiloe Island to the mainland. It will be the largest suspension bridge of its kind in Latin American. Four lanes, 8500 feet long. The project is an international partnership with Korea, Brazil, France, and Norwegian companies. At a cost of $680 million dollars. We ask a crew of construction workers erecting new tourist signs what they think about the bridge. At first, we get a mix of shrugs and looks of resignation. But they have strong opinions. Sure, it’ll be good for a lot of them. More accessible medical care. Better schools. More tourists with money to burn. 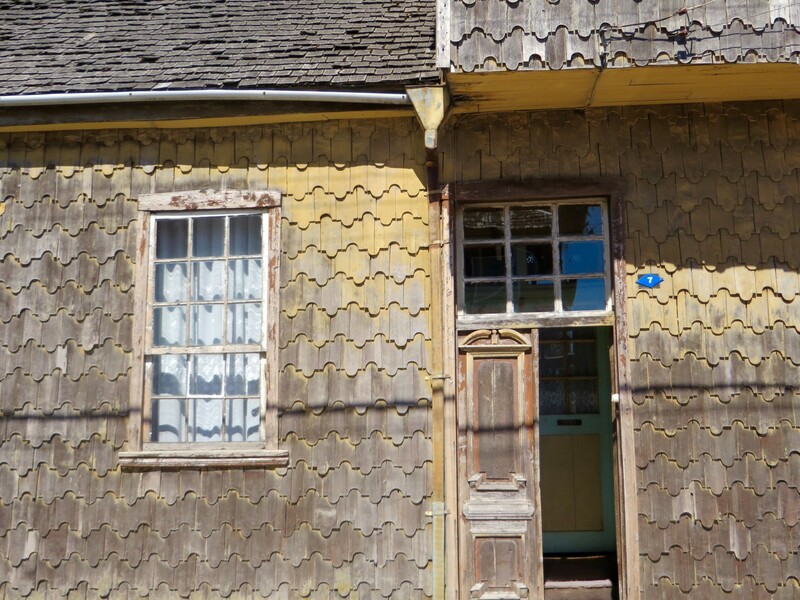 Our local guide wonders what that kind of money–more wisely spent–could do for the island. A woman in the craft market tells me it’ll be the end of their tranquil life. As if I’m allowed to have an opinion, that’s the part I feel sad about. My imagined dream-house, perched on the hillside will soon be surrounded with others just like it, crowding out my view. Obscuring paradise. Those of us privileged enough to travel widely are racing around the world to see places that pretty soon won’t exist. At least not as we might wish to remember them. East Africa. The Maldives. The Alaskan tundra. The Taj Mahal. Like Chiloe Island, some changes are not due to climate change. Cuba, for example. I’m hoping to go there before progress changes that culture too. But who are we to say, others shouldn’t have what we have? 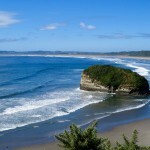 The next day, we drive to the other side of the island, with a view of the Pacific Ocean. It reminds me of home–before the offshore oil rigs and time-share resorts and multi-million dollar homes teetering on the edge of a cliff. The coastline here remains largely untouched, protected by scrubby plants and a sandy cove. We are taken in motor boats out to a couple of rocky outcrops that are home to Humboldt and Magellanic Penguins. 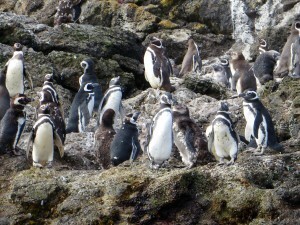 Within fifty feet, cameras in hand, we watch the penguins waddle up and down the rocks. Their gait is clumsy, awkward. You can’t help but applaud their scrappy determination. I wonder: do they sense what’s coming? Is there anywhere else for them to go? Fellow travelers and environmentalists. How do you define progress? What’s worth saving, just as it is? Your photos are gorgeous. I love South America and would love to see Patagonia. Can’t wait to talk to you after you return. Thanks Susan. I’ve fallen in love with Patagonia. The scenery is so spectacular. Snow-capped mountains, glaciers, penguins, condors, guanaco. And the people of down-to-earth, generous, and very proud of their region. The encroachment of modern life on the last remaining wild places is a profound tragedy. It’s ironic that the sense of imminent loss in places like this makes our experience of them so intense. We can and should work to protect them, donate to conservancy groups and vote for like-minded people. Maybe more importantly though, when we do have the chance to experience unspoiled natural beauty like you are right now, we should do just what you’re doing; soak it in, reflect on our relationship to earth, and share the power of places like this to renew our spirits. Thank you Elie. Marvin, Always love your comments. 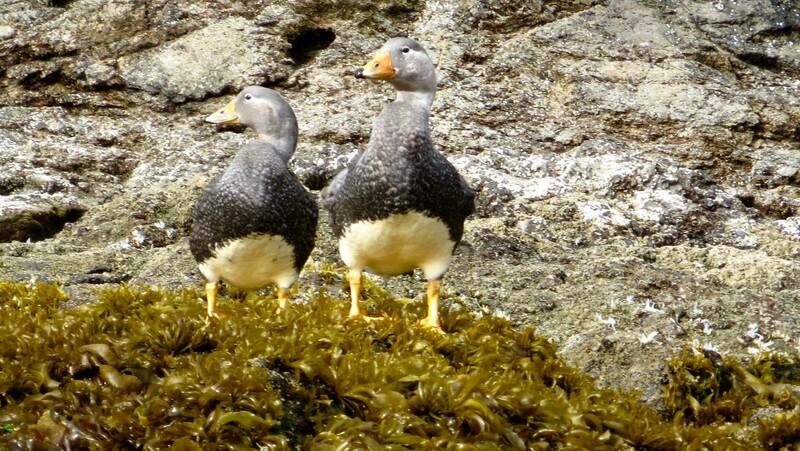 Lucky you to have calm seas and get to hike on Cape Horn! I’m off to Antarctica tomorrow and hoping for the same. Wonder what blog post will emerge from my trip?! Have you read Maya’s Notebook by Isabel Allende? It is set partly on that island and will give you even more of a picture of the life there. After reading the book I felt grieved by the encroaching bridge. It’s a bit of a helpless feeling for both sides, but I’m sure mostly for those on the island. There clearly isn’t anything they can do to stop it. Thanks Judy. I’ve read a lot of Isabel Allende, but not Maya’s Notebook. Thanks for that tip about it being set on Chiloe Island. Can’t wait. Thanks Dorothy! In a couple of days, I’ll be posting about Antarctica. 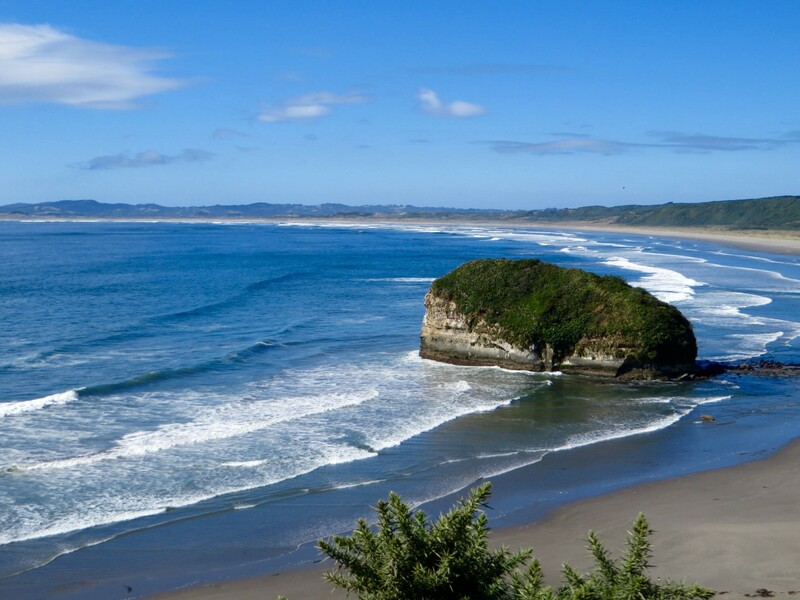 Elie, this reminds me of traveling in Vietnam and admiring the gorgeous beach at Danang. A short distance down the beach, it was completely obscured by tall plywood barricades sporting notices that read, “Future Home of the Hilton!” I asked our guide about it, who said the local Vietnamese were not at all bothered by future lack of access to the beach, or its beauty being ruined by the ugly hotel complex. Vietnam is a poor country, working hard to catch up with the economies of other Asian countries: they want JOBS, which the construction and running of the Hilton would provide. As you so eloquently put it, who are we to tell people they shouldn’t have what WE enjoy? Yes, who are we to say? But of course, we can’t help but feel sad. It’s certainly happening all over the world. Glad you enjoyed the Antarctica post. I’d woken up at 5:30 one morning with part of the poem in my head. And then I’d actually gotten out of bed and walked outside to write it. Sure glad I did! Hope you get some relief soon from the snow!